A nice supper for the Gold Corporate Partners of the Chartered Institution of Highways and Transportation last night. Wonder if Rupert Clubb mentioned the A27 East Of Lewes ? Wonder if any of the Partners came from construction companies ? The Chancellor's 2018 Budget spread breadcrumbs around Conservative favourite causes yesterday, with a promised of fully-buttered slices if MPs back a Brexit deal blind, with the last cards still to be turned by the EU dealer. Check back to count how many Hammond promises of more funding start from 2020. One sprinkle of crumbs came in the form of an additional £420m for local councils to spend mending potholes, shared between 214 councils. East Sussex County Council, and their building chums at Costain, spent £1.4m on pothole and pothole prevention in the year to March 2018. Cycling UK runs a website for members to report both new holes and fixed holes. and puts East Sussex at 186th in a their league table, with 1137 potholes reported, 106 reports still open, and 124 fixed - a percentage of 11%. Still, East Sussex and Highways England can now spend more taxpayers' money fighting for a slice of the newly enhanced £28.8bn RIS2 new road fund. Remember, they've spent £3m trying prove the case for a new dual carriageway between Lewes and Polegate - twice the money they spent on the county's potholes in a year. Car drivers will supposedly be hooting with delight at the news that Chancellor Philip Hammond plans to up the spending of Highways England (and thus the income of construction companies and their consultants) by 40% over the next five years. Maybe when it comes to voting time, they'll remember what's happened to the price of petrol. 75p a litre when the Conservatives came to power in May 2010 - 62% of that tax. Today's average 130p a litre of which 61% is tax. Since 2010, the Government has raised just under £6bn every year from Vehicle Excise Duty. In 2010 councils in England collected £21.9bn from us; in 2018, it was £28bn, yet they can't afford to mend potholes. Central government currently doshes up a majestic £300m a year towards lumps of tarmac; Mr Hammond promises an extra £420m. Industry estimates put the true cost of putting every road right in a year at £11.8bn. Local councils' total spending on all elements of transport last year was £4.4bn. Increasingly, councils are having to pay for damage to cars from potholes - the AA estimates car claims are running at over 4,000 a year and rising, there are thought to be matching figures from cyclists. So more money for new local and national roads, rather than mending the ones we've got - and supporting and increasing motorised transport which currently delivers 22% of this country's greenhouse gas emissions - rail and air travel together count for 2%. Makes sense, eh ? We all look forward to the new information being made public. Remember, here in East Sussex, Highways England has found a way of re-calculating the economics of an off-line dual carriageway for the A27 East Of Lewes so that it has, suddenly and magically, become good value for money, at upwards of £450m. The mechanics of this re-calculation have yet to be shared with residents. An interesting report today from the campaign group Transport for New Homes, which found that, in general, developers in the UK don't think about public transport, walking and cycling when they plan new homes - and, in general, neither do the planning authorities. funding then goes into road capacity to enable new car-based estates to be built. " "One of the consequences of car-based development is the generation of traffic. Using Google Maps you can look at the road network and see where the traffic jams are found. We animated Google maps with traffic switched ‘on’ to condense the rush hour down to under half a minute. We saw the congestion move in waves from junction to junction, revealing the network nature of bottlenecks. "Many roads between new homes and the urban areas where people work were already full of traffic. It was also apparent that long distance traffic was being held up by local commuter traffic and that this trend is likely to get much worse if we continue to build as we are." "What about building more roads to compensate? It is impossible to unblock the road network by attending to ‘pinch points’. It is the whole road network that is becoming widely congested around our towns and cities, aggravated by car-based out of town construction. A transport assessment may show two or three thousand new new car journeys a day emanating from a large area of new homes. However the cumulative effects of many new developments across an area is never modelled. "Spending public money on road building in conjunction with new homes and using scarce developer funds for the purpose, is likely to make matters worse. It actually encourages more distant commuting by car." "In some cases we heard that locations for new homes were actually chosen because they could fund road capacity – the other way round from choosing a site and then sorting out the roads." East Sussex County Council's Rupert Clubb "has a wide range of responsibilities affecting our quality of life and how we live, travel and enjoy our local environment." You could be forgiven for thinking what he really likes is roads. He's also Chief Officer forTransport for the South East, and will be hosting a stall at the Highways UK conference at the NEC in Birmingham for two days in November. 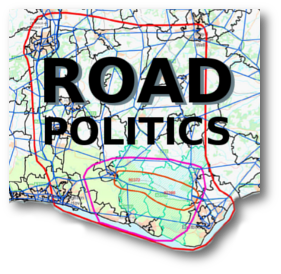 Says Rupe “It’s a chance to tell people more about the difference we will make to the South East and the crucial role that a modern, smart and sustainable road network will play in our strategy. That's roads. Not rail, buses, bicycles, working from home and walking. Those arguing for an offline dual carriageway between Lewes and Eastbourne usually start with its alleged economic benefit, never as yet publicly proven. The reality is that the A27 is mainly a commuter road. Only 15% of its traffic is good vehicles. Greater Eastbourne is a dramatically cheaper place to live for those working elsewhere in East Sussex and beyond - the average house price is £239k, compared with £320k in Brighton Kemptown, £327k in Lewes, £332k in Wealden, and £360k in Brighton Pavilion. Under-provision of good public transport leads to more car use. Wealden tops the A27 East constituencies, with 69.8% of the population using a car to get to work. Compare that with Brighton Kemptown, where 49.5% use a car. If councils were measured over-time by how much they've reduced single-driver car journeys and their consequent pollution, we might have a different approach to the development of this lovely part of the world. Thank you for coming to our Parish Council meeting. If you can't share the detailed business case you've made for RIS2 funding yet, then please release the headings for each section of the document, and the number of pages in each section, and the headings and number of pages in the appendices. Then perhaps we can get a sense of the areas covered by the bid, and their scale, even if the detail is too sensitive for mere voters to read. I happen to believe that the Department of Transport is taking, quite properly, an evidence-based approach to the assessment of which projects to fund in RIS2, and that the Reference Group/Highways England have together spent £3m making the case for a dual carriageway which doesn't follow the route of the existing A27. I'd be delighted if you'd prove me wrong. Many thanks for your email. I have committed to publishing as much information as I can and I am working with the County Council to see if we can use their website to publish this information as soon as possible. It is not the case that the information is too sensitive for residents but until all bids are in, releasing local information will put us at a disadvantage against other local authorities. Once the bidding is closed there shouldn’t be a problem releasing the information for everyone and I am working to see how we can best share this information going forward. She told me we didn't need all that FOI stuff; that if we just email her she'd be as transparent as possible. She couldn't release the case that had been made to the Department of Transport, because it was "competitive" and "business-sensitive", but would release it once all bids were in, because that wouldn't put her case at a disadvantage to others. So I'll give it a go. Here's my email. In July 2018, Transport for the South East, in charge of researching and developing plans for our area, released a review called Economic Connectivity. Buried at the back, a map showing estimated traffic flows on major roads in 2040 - i.e. after the current £75m-worth of improvements to the A27 between Lewes and Polegate. It shows the current, partially single-carriageway road as having 'moderate congestion' in the morning peak. There is severe congestion predicted for the Lewes by-pass, from Kingston to Southerham, and regular congestion beyond Polegate. So why not spend the money there ? Why spend £450m on a dual carriageway to alleviate 'moderate congestion ?